This innovative title is the first of its type to focus specifically on the vast array of wildlife-watching opportunities found in Europe, packaged into 52 weekend-sized breaks. This innovative title is the first of its type to focus specifically on the vast array of wildlife-watching opportunities found in Europe. Written by expert James Lowen, author of the best-selling 52 Wildlife Weekends: A Year of British Wildlife-Watching Breaks and award-winning A Summer of British Wildlife: 100 Great Days Out Watching Wildlife, this unique guide is packaged into 52 weekend-sized breaks highlighting the best of European wildlife including mammals, reptiles, amphibians, flora, butterflies, dragonflies and birds. We may think of snow-covered Antarctica, South American jungles or African savannahs as holding the world's most plenteous and special wildlife, yet Europe heaves with wildlife wonders year-round, many of which can be seen in a simple weekend break. 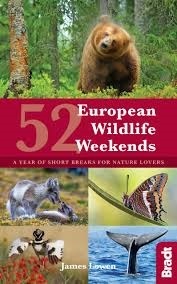 This book suggests one wildlife-watching break, somewhere in Europe, for every weekend of the year. Want to see brown bears? Make for Finland or Slovenia. Fancy a crack at wolves? Hop on a flight to northern Spain or Italy's Abruzzo. If whales float your boat, a long weekend in Iceland, Ireland or the Bay of Biscay would suit. Orchid lovers can head to Corsica, Crete or the Costa del Sol in spring. Birdwatchers can flock to see migrating raptors in Gibraltar, great gatherings of cranes in central Spain, or vast flocks of seaduck in Arctic Norway. Then there's the wacky olm in Slovenia, cave salamanders in Sardinia and owl-flies in the Picos de Europa. Hungary's mayfly emergence is truly spectacular, as are Norway's musk oxen and Poland's bison. Stretching from the Arctic to its boundaries with Africa and Asia, Europe has enough exciting living creatures amid jaw-dropping landscapes to fill an entire lifetime of wildlife-watching. Ideal for both the experienced wildlife tourist and the novice and packed with stunning colour photos, this book shows when, where and how to see the most exciting wildlife, complete with inspiring itineraries, engaging descriptions, detailed directions and tips on how to find, identify and enjoy animals and plants. Each entry gives details on species of interest and the landscapes they inhabit, plus suggestions for extending your quick break into a longer visit.